Tazawako Komachi Weiss is a 5% German hefeweizen, brewed by Tazawako Beer, based in Akita, Japan. It’s part of their limited edition range and can be found in both bottles and on tap from Autumn onwards, usually around from the beginning of October. 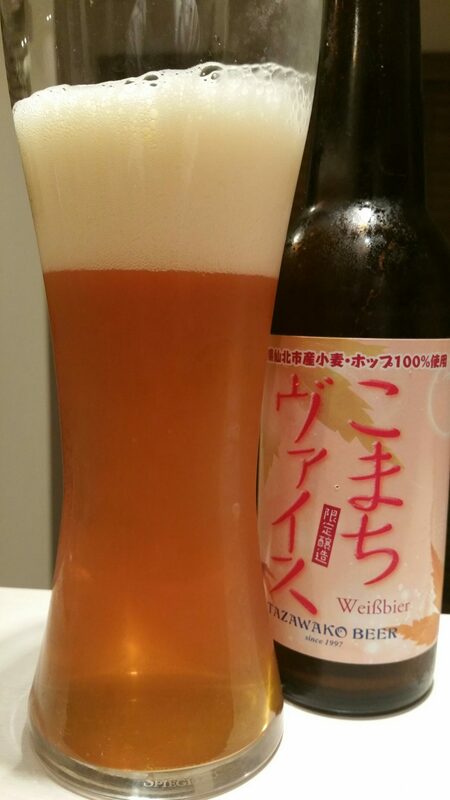 Tazawako Komachi Weiss, or as it says on the label weißbier (weissbier), is brewed with 100% of the ingredients coming from the Akita area, and also brewed using komachi rice, a famous strain in Japan. If you’ve got lots of rice, make some beer. Tazawako Komachi Weiss poured out a hazy golden amber colour with a medium amount of large frothy white head, that sadly collapsed in on itself after no more than a few minutes. A little disappointing for a hefeweizen. It had a slight bubblegum aroma, with hints of cherries and bananas going on as well. There was a slight phenolic Belgian-like quality to it – in fact it was all so delicate that I’m surprised Tazawako Beer hadn’t taken the approach of other breweries in Japan and advertised this beer towards the female part of the market. The taste started off with a dry, crisp bite with just a hint of slight grapefruit bitterness too. The wheat flavours produced a slight edge that contrasted with the bitterness, and produced a hint of sweetness to it too. The most surprising thing about Tazawako Komachi Weiss was how comparatively low carbonated it felt – very smooth and soft on the palate without much life in the bottle. When it had warmed up to room temperature, Tazawako Komachi Weiss’ bitterness became more pronounced. The phenolic aftertaste faded quickly, leaving a slight creamy flavour on the palate. Tazawako Komachi Weiss is a nice little weiss that isn’t offensive or overpowering. If Tazawako Beer could tighten up the flavours to remove some of the unusual flavours, it would be a definite recommendation.